This sought after wild green is a plant that not only tastes good but contains lots of nutrients. According to a study in the Journal of the American Dietetic Association, 100 grams of miner's lettuce contains a third of your daily requirement of vitamin C, 22 percent of vitamin A, and 10 percent of iron. During the gold rush, miners ate them to prevent scurvy, giving the species its common name. This plant is a native winter annual broadleaf plant in the Montiaceae family. 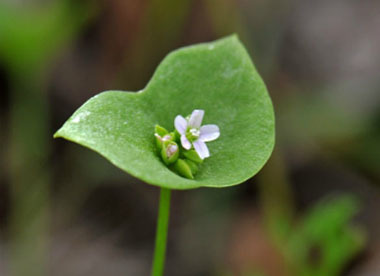 Distinguishing Features: Miner's lettuce is a small, herbaceous, slightly succulent annual plant. 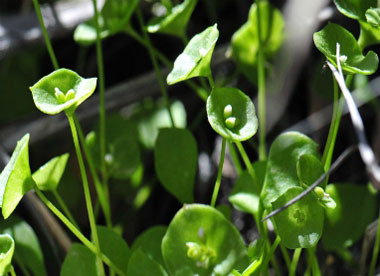 Miner’s lettuce is light green in colour, and has round, disk-like leaves, which surround its smooth, tender stem. The stem passes directly through the round leaf and this makes identification easy. After the plant has bloomed,there is a small white or pinkish colour flower growing on top of its rounded leaves. Flowers: 5-petalled flowers bloom from February through May. Anywhere from five to forty white to pale pink flowers occur on slender down-curved stalks cluster above a circular to weakly squared, often cup-like, green structure (bract) that looks like a leaf and completely surrounds the stem. 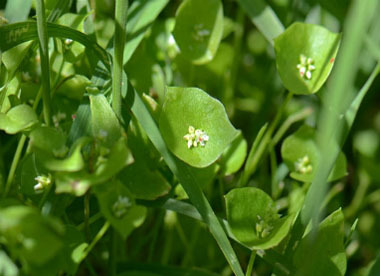 Fields of Nutrition has medicinal benefits and vitamin/mineral content of Miner's Lettuce. Leaves: Young leaves are basal and are narrowly oblanceolate, narrowing to a short petiole. As it matures, basal leaves become oval to triangular, held aloft on long petioles. The two cauline leaves lack petioles and are opposite on the stem, fusing at their bases to form a collar around the stem. The leaves are usually bright green, sometimes streaked with white and on the odd occasion, reddish. 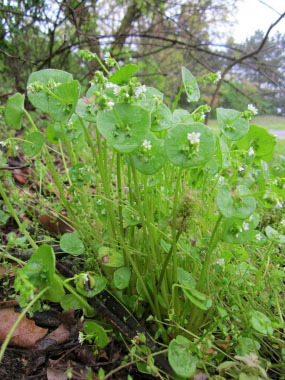 Height: Miner's lettuce can grow up to 30 cm (12") but is generally smaller. Habitat: It is most often found in winter and early spring in shady spots associated with a wide variety of vegetation types, from coastal sage scrub and chaparral to oak woodland and pine forests. 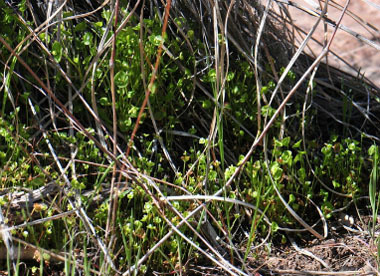 It grows in moist, shady areas along streams in the desert and in the mountains. It is usually found growing in wetlands, but it is sometimes found in non-wetlands. This plant is common in western Canada and U.S. It also grows in parts of Central America, Cuba and Australia. Edible parts: Flowers, leaves and roots are edible. Young leaves can be consumed raw or cooked. Older leaves can turn bitter especially in the summer and if the plant is growing in a hot dry location. Flowers can be tossed into a salad. Native Americans harvested the stems,leaves and blossoms and ate them fresh or boiled.